Sunday was quite an adventure for a few of us SparkFunions. 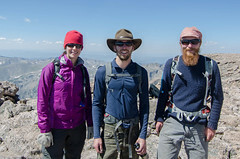 Ben (KD0PNS) and I (KI6YMZ) participated in the Colorado 14er event. 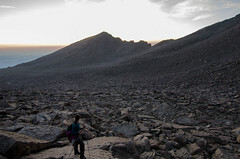 On one day in August, people summit as many of the 50+ fourteeners in the state as possible. The catch is that we all carry amateur, or ham radio equipment to the top. 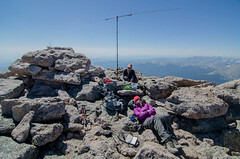 Due to the prominence of most of these peaks there is little interference or free space path loss, so it is possible to talk on VHF frequencies to parties on summits around the state. 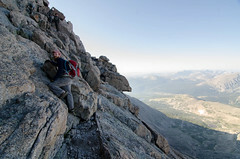 Of course being the young and foolish people we are, we decided on Long’s Peak for our summit of the day. We dragged along Toni from tech support and set out to summit first thing in the morning. We hit the trail just before 3 a.m., and got to see a beautiful sunrise from the trail. Those familiar with the hike know it’s more of a climb than anything. The last two thousand vertical feet or so are a steep trek up various sections called The Ledges, The Trough and The Narrows. All of which are rather exposed and make for an exciting adventure. We did make it to the summit with all our radio gear and time to spare before the event started. Ben immediately turned on his radio and got two contacts that were waiting on frequency for us in the cities below. As the event started up we made contacts on many of the 14ers around the state including Pikes Peak, Quandary Peak and even a local Cessna pilot who got in on the fun! We primarily stuck to the two meter band, but also set up an HF antenna on 20 meters as seen above to make some longer distance contacts. In addition to ham radio equipment, we carried up a payload for a radio test from the guys behind SkyCube. They have been working on a kickstarter campaign to get a cubesat into space early next year. 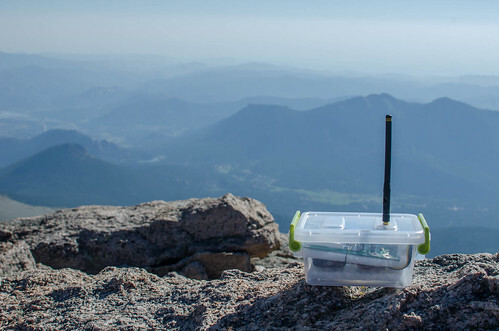 We sent SparkFun engineer Mike out with a high-gain yagi antenna to listen in for the “hello world” the payload was transmitting in Morse code from the summit of Long’s. Unfortunately there was a slight miscommunication, and the receiving radio was tuned improperly to run the test. But fear not! We ran a simpler test yesterday from the top of Flagstaff Road here in Boulder with great results. When we all returned, completely exhausted from the 15-mile hike, we geared up for the next event - watching the entry, descent and landing phase of the Mars Science Laboratory. We joined a handful of other ‘Funions at SFE HQ where we drank beer and celebrated the nail-biting successful landing of the rover Curiosity on the Martian surface. Sitting on the edge of my seat, watching and waiting during those seven minutes of terror was one of the most inspiring and motivational things I've experienced in a long time. The photos aren't bad, either. Even though it started in the UK, there's a North American SOTA mailing list that's quite active. Regarding the "how far can 5 watts go in clear space" - back in 1993 when I first got my ticket, my first radio was a Heathkit HW-2P handheld 2 meter radio. I also was very interested in packet radio, so I got a KPC-3 TNC as well, and soldered up an interface cable. Using that radio, at 5 watts out, hooked up to a six-foot hunk of twin-lead antenna line as a j-pole antenna, and hanging inside my apartment balcony door, I regularly logged into the packet BBS on the Mir space station, no trouble at all. Yep, there was - you could leave messages for the cosmonauts or for other hams. I also talked voice to one of the cosmonauts for a few minutes from my car on the way from Omaha to Sioux City for an amateur radio convention. you'll see where I bounced an APRS packet off of Mir in the 1999 timeframe with my (at the time) new Kenwood TH-D7A handheld that has a built-in 1200 BPS modem. Used a normal rubber duck antenna for that one. There was a BBS on Mir? My mind is slightly blown. What, no SparkFun flag flown at the summit? Don't just wish; make it happen! It's possible. Great trip! Looks like fun. How did you win the attention of a woman in good enough health to climb that? BTW, "hint hint" is right - Sparkfun should sell ham gear. Like GMSK modems and AMBE codecs to get on D-STAR without paying Icom insane amounts of money. 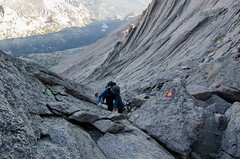 "[M]ore of a climb than anything"? Really? The Ledges, Trough and Narrows probably make up 20% of the 15 mile round trip. Out of curiosity, how was the signal quality between Pikes and Longs? What power and type of antenna were you using? I've never hauled any of my gear up with me while hiking or backpacking and always wondered what kind of range I'd get when nearly 3 miles high. We were operating with 5 watts on the two meter band with simple rubber ducky style antennas and it was just about crystal clear to Pikes Peak from Long's. It's 102.4 miles peak to peak, but most of the land in between sits at less than 8,000 feet, so it was a pretty clear shot. We were hoping to contact Mt. 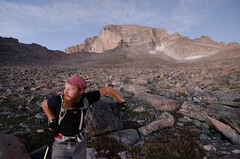 Sneffles and set a new distance record of over 215 miles, but were unable to do so. I'm convinced it can be done with a better, perhaps directional (yagi) antenna - there's always next year! Lookup the metal tape measure yagi. Simple, cheap to construct, and lightweight. Cool to use if you want to take a shot at getting to the ISS on 2 meter. Also a simple roll-up or collapsible J-Pole would be effective for omni. I also dragged up a buddipole for HF operation. I did set it up on 2M for a bit, but it wasn't much more effective than the rubber ducky so I left it configured for 20 meter operation. I just talked to the A0-27 using this handheld arrow antenna and it worked pretty well! That's exactly the one I've got my eye on, glad to hear it's got some good real-world reviews :) Too many toys, too little time! Wow. Much better than I thought! I know you have LOS, but I wasn't sure how far you could go on 5 watts and an antenna that has little or no gain. I'm confident you can reach Sneffles with a yagi on one or both ends. When is Sparkfun going to build a Mars rover? I imagine about the same time they can afford to spend millions of dollars for a rocket and fuel to get it to Mars. Bah! The apollo guidance computer was essentially a 70 pound arduino. There are plenty of faster and more powerful choices, including ones from Atmel, TI, Zilog, Microchip, Freescale, etc. What you might not get is the mountains of amateur and/or professional level code written specifically for them and any number of peripheral products. Every single one of these manufacturers, however, provide professional level tools to support their products, and also provide free engineering and technical support to all comers. Remember: assembly code isn't really that difficult. Once you develop a mindset for breaking larger tasks down into smaller components, you might even find it preferable to using a compiled language, such as C and it's variants. If you become skilled in using assembler, you'll also be blessed with a faster workflow, and extremely fast and tight code. 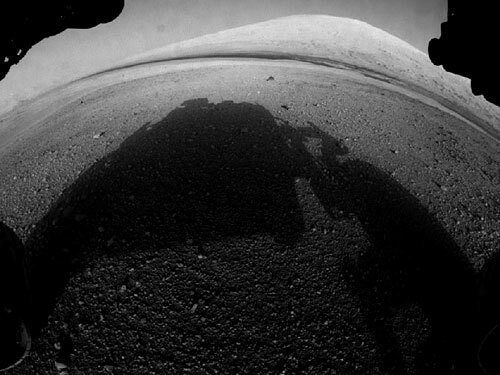 Honestly radiation hardening and thermal tolerance are larger issues for extraterrestrial rovers than raw processor speed for rover control. For example, with a Mars rover there's a 5 to 10 minute delay (depending on how far apart Earth and Mars are at any given time) on radio transmissions, each way. So even at a paltry 16 MHz there's plenty of spare cycles and no rush. BTW, here's how NASA's previous generation of Mars Rovers were driven. Twit.tv has a great recording of their live broadcast during the mars landing, they interview one of the 'Sky Crane Specialists' and one of the questions was what sort of hardware is running inside the curiosity. Also, it's apparently entirely programmed in C, with a little bit of C++. Very cool activities... The wiki link however I think needs updating... maybe http://en.wikipedia.org/wiki/List_of_Colorado_fourteeners? I don't think you meant to link to the NBA Development league.